Because it Lasts the Longest! It also triggers the immediate exodus of both free and bound water in the fiber structure and cellular make up of thatch. The thatch is less likely to moisture, either air borne humidity or in liquid form. Expansion and contraction of the thatch ceases and total dimensional stability is obtained, protecting thatch as it ages. The end result of the treatment renders the thatch 100% insect free also. In Even the Harshest of Climates! Unlike other sealers and other proprietary coatings currently being utilized Worldwide and only lasting for short periods of time, this product penetrates deeper than any known alternative and what's more, it actually continues to work for extremely long periods in most climates. Excludes abnormal weather and non moisture draining subroofs. All You Need is a Paint Sprayer and a Coat! When applying to your thatch or bamboo wall covering simply use a paint sprayer and coat, applying it very heavy the first time on both sides and let dry. Depending on your climate, drying times vary. Our thatch sealer is quite simply the product to use for palm thatch materials. Each gallon covers about 225 sq ft which is 1 30"x60' Thatch Roll both sides. 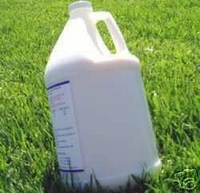 Comes in 1 Gallon Jug. Please note that this is not Thompson's or Olympic Water sealer. These products will dry thatch out and take away your thatch life. *2 years if we spray Thatch Sealer. Do You Need Tiki Thatch Roofing and Material as Well? Shop Online and Browse our Fantastic Range of Tiki Thatch! Did you Know About Our Thatch Sealer Rolls? → 90% of Orders Ship Same Business Day! → 500,000+ Satisfied Customers CAN'T be Wrong! Need More Help Before Buying?